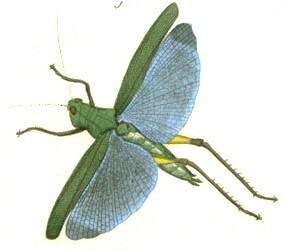 llustrations of Natural History. 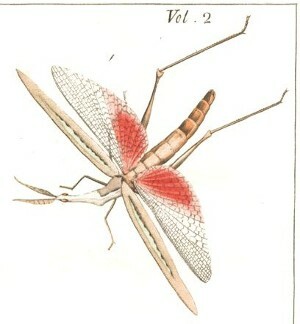 Wherein are exhibited upwards of two hundred and twenty figures of exotic insects, according to their different genera ; a very few of which have hitherto been figured by any author, being engraved and coloured from nature, with greatest accuracy, and under the author's own inspection, on fifty copper-plates. With a particular description of each insect : interspersed with remarks and reflections on the nature and properties of many of them. To which is added a translation into French.- B. White, London, 2 : vii + 90 p.[+ 2 p. index], 50 pl. FIG. I. Expands a full inch and a quarter. Africa, situated in about 6 deg. North lat. I have not met with it in any author. convexités.-- Les Etuis vertes foncés, et opaques. ment jaunes ; les jointures de jambes etant noires. situé environ le sixieme dégré latitude nord. Je ne le trouve en aucun auteur. I received it from Rio Janeiro, in the Brazils. Bouche semble être placée dans la poitrine. grimper sur les plantes, etc. ou ils vivent. Je l'ai reçeu du Rio Janeiro aux Brasils.